Measuring (oustide dimensions) approximately 6" x 10" x 2-1/2", this jewelry - keepsake box offers 4-1/4" x 6-1/4" x 1-5/8" black velveteen lined storage. It also offers flush mounted hinges and a magnetic closure. Your personalized Friendly Folks cartoon caricature, measuring 4" x 6", is housed behind glass on the top. 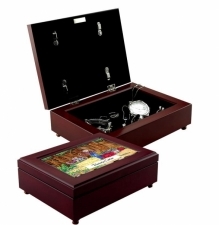 TIP, Click Here --> We recommend viewing Friendly Folks by category, and then selecting a jewelry-keepsake box.